"Free Wheeling Fun and Fitness Right at Your Furry Friend's Feet"
Excellent Exercise for: Running pet rats, cruising chinchillas, and other physically fit furry friends. 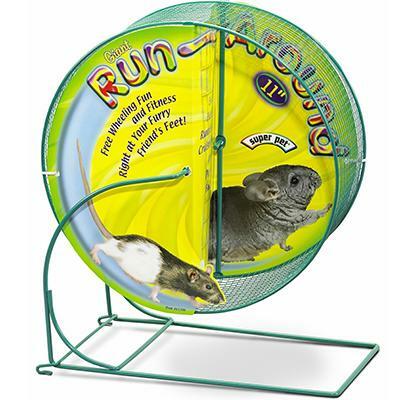 The Run-Around Wheel is designed to be very versatile and perform perfectly inside any pet's home. Fits on the floor of any cage or glass aquarium. Or, securely hangs on the side of any wire home. Plus: The exclusive mesh running surface is super safe, sanitary and completely comfortable for your critter's paws. Now you can really give your pet the Run-Around and cure your "Critter Cage Potato." It's certainly the safest and most satisfying stationary spinner, specifically sized for your small animal.